It is difficult for mainstream Shules to survive in their earlier form. A powerful method of attracting people back to Shule membership is to court iconoclasts and embellish them with a podium. A Melbourne Shule is seizing the moment, so to speak, as I understand they are sponsoring a visit from Rabbi Shmuley Boteach. Rabbi Boteach is a controversial figure. Ostracised by Chabad, I haven’t noticed him gaining traction with Modern Orthodox organisations. let alone right wing or ultra orthodox. He is visible amongst non-Jews and those outside the pale of traditional orthodoxy. I expect he is also motivated by a wish to influence Jews to become more devout as well as inspiring non-Jews to commit to the seven noachide laws. Is he the best man to do so? Boteach did himself no favours when he poorly debated Christopher Hitchens. That debate was embarrassing, to put it mildly. We Jews are the people of the book, not the people who ban books. Boteach expresses the view that he does not understand how Schochet could argue against missionary activity and at the same time choose not to discuss Boteach’s book in any detail. Rabbi Schochet seems to have significantly changed his approach to Judaism and Christianity since his lectures under my auspices. Back then he orated openly on Jesus and the New Testament, rebutting missionary claims and engaging missionaries in public dialogue and exchange. There are hundreds of his tapes that attest to this fact. R’ Schochet may or may not agree that it is “well-researched” but he too clearly feels that it will reopen intra and interfaith dialogue. Does Boteach expect us to be convinced that his book can’t be heretical because of the review by Publisher’s Weekly? I question whether Rabbi Boteach has brought even one Jew involved in Christianity back to their roots through his debates, and suggest that it is little more than image and soundbite. I don’t see anything in the letter that calls Boteach a heretic. Rather, R’ Schochet carefully crafted his words to refer to Boteach’s book as problematic. I know that for Rabbi Weiss, even the willingness to be open to talking to apikorsim is a risk. But when the goal of the discussion is already a foregone conclusion, the conversation isn’t very risky. Rabbi Boteach might not think it’s risky; others clearly do, and they do not feel an obligation to elaborate and give Boteach more airtime, as this would simply provide fuel for the fire. Let’s be under absolutely no illusions here. R’ Boteach is not a Rabbi Slifkin. Rabbi Slifkin’s books were banned by people who couldn’t read English, let alone who had read Slifkin’s books. R’ Slifkin is an author of erudite and learned Jewish books based on Rishonim and Acharonim. Time will show that Rabbi Slifkin’s approach to documenting an orthodox perspective on Evolution eminently sound and commendable. I’m a fan of Rabbi Slifkin and his essays. Boteach isn’t a Rabbi Kamenetsky either. 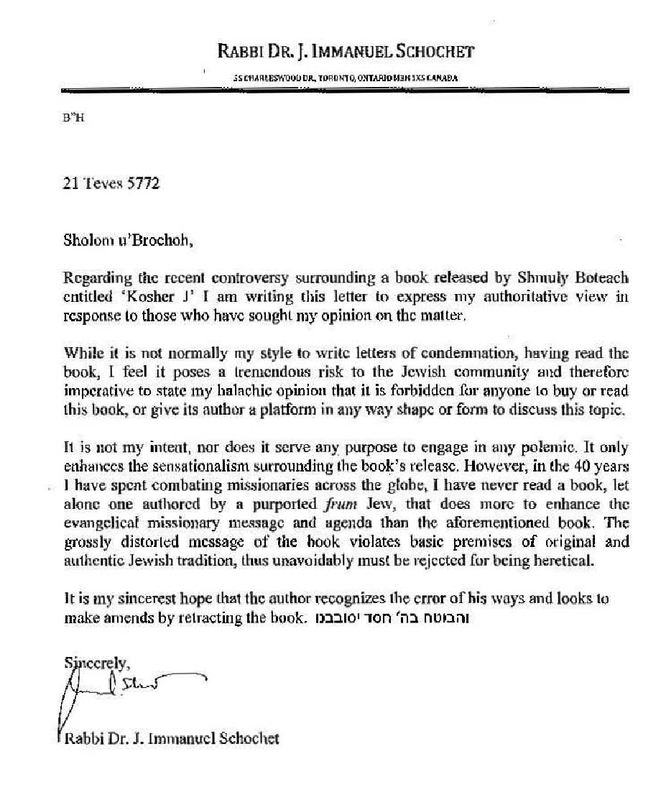 Kamanetsky’s book “the Making of a Gadol” was unfairly banned and later modified because it was seen to embarrass R’ Aron Kotler ז’ל and other Lithuanian Rabbis look “too human”. The audience for Boteach’s book, however, is mainly the non-Jewish world and perplexed Jewish fringe dwellers. Is the correct approach to attempt to re-educate our co-religionists that they should see themselves as derivatives of Judaism? They worship J, and see him as “above Judaism”. What will Boteach achieve through this passively aggressive attack on their well-seated belief system? Will the world become happier and a pluralistic paragon of peace? Does Boteach think that he’s the first who realised that Saul of Tarsus was the man who fashioned what that religion is today? I have a religious colleague at work who likes to regale me daily with his “inspiration”. I’m quite tired of it, to be honest. In the last week I asked him to come back to me with the historical record of when Shabbos became Sunday, who initiated this, and why. It has quieted him. I don’t see any value whatsoever in challenging his belief system (he thinks he can speak in tongues) and I don’t expect him to challenge mine. The Rav’s opposition to communal, and organizational interfaith dialogue was partly predicated upon the prediction that in our search for common ground — a shared theological language — Jews and Christians might each sacrifice our insistence on the absolute and exclusive truth of our respective faiths, blurring the deep divide between our respective dogmas. In an essay titled “Confrontation,” Rabbi Soloveitchik argued that a community’s faith is an intimate, and often incommunicable affair. Furthermore, a faith by definition insists “that its system of dogmas, doctrines and values is best fitted for the attainment of the ultimate good.” In his essay, the Rav warned that sacrificing the exclusive nature of religious truth in the name of dialogue would help neither Jews nor Christians. Any “equalization of dogmatic certitudes, and waiving of eschatological claims, spell the end of the vibrant and great faith experiences of any religious community,” he wrote. Rabbi Soloveitchik worried that theological dialogue would create pressure to “trade favors pertaining to fundamental matters of faith, to reconcile ‘some’ differences.” He argued against any Jewish interference in the faith of Christians both on grounds of principle and out of concern that this would create the framework for reciprocal expectations. Now, the changes in Catholic attitudes detailed by Dr. Korn are real, welcome, and significant, but they do not undermine these concerns. Quite the contrary. The trajectory of dialogue to our own day has confirmed the validity of Rabbi Soloveitchik’s analysis to an almost stunning degree. 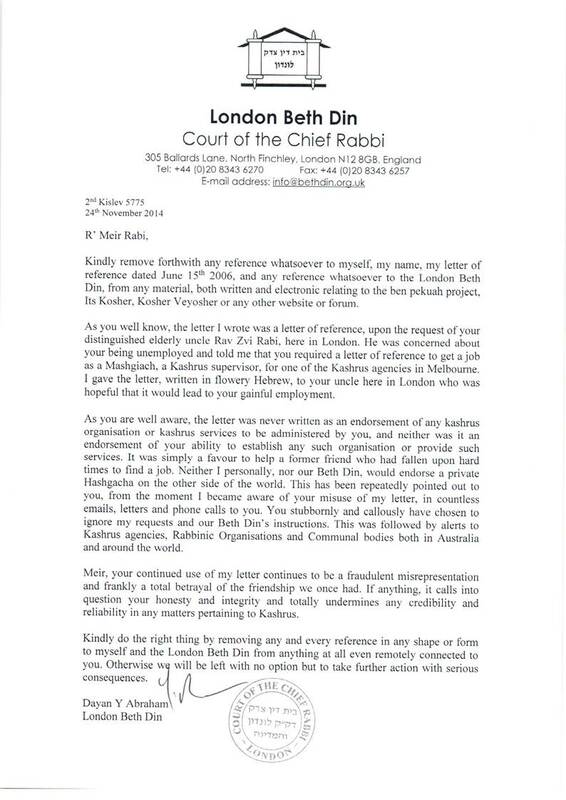 With this background clearly in mind, perhaps the Melbourne Shule that has now invited R’ Boteach to speak has also broken ranks with the Rav and the RCA and embraced the views of YCT. As noted above, R’ Boteach’s views are seen to be even more left-wing than YCT. It should make for a controversy that will occupy the Jewish News and further seek to redefine the relevance of Shules and methods for attracting and retaining membership.